Gym newbie, seasoned athlete, young or old, everyone wants a strong core and flat stomach. Thankfully, there are many effective ways to train your torso. 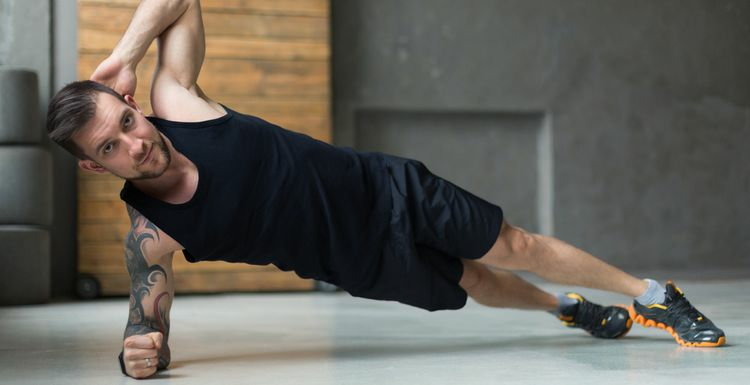 Whatever your current fitness programme contains, add in these 5 simple exercises to deeply strengthen your core muscles. Do these exercises on a mat or carpeted floor for more comfort. Breathe deeply and keep your torso tight. Repeat each move five times, building up to 10 reps as your core strengthens. Brace your core and off you go! Lie on your back with bent knees. Tighten your abs and keep your spine neutral. Lift your hips until they are aligned with your knees and shoulders. Breathe deeply for three counts. Relax your hips to the floor and repeat. Lie on your back with bent knees. Spine is neutral and abs tightened. One at a time, lift your legs off the floor until knees and hips both form 90 degree angles. Press your hands against your knees as you use your abs to pull your knees towards your chest. Hold for three breaths. Lower the feet back to the floor and repeat. Get on your hands and knees with hands directly under the shoulders. Tighten your abs. Lift your right arm and left leg off the floor simultaneously. Hold for three breaths. Lower and repeat with your left arm and right leg. Continue alternating sides. Lie on your left side, lifting your body to rest on your left forearm. Keep your shoulders, hips and knees in a straight line, your right arm resting along the right side of your body. Tighten your core, holding for at least three breaths. Repeat on the other side. For extra challenge, balance on your left hand. Lift your torso off the floor as you stretch your right hand upwards. Hold for three breaths. Repeat on the other side. Lie face down on the floor. You can use a folded towel to support your head and back if required. Tighten your abs. Breathing out, simultaneously raise your arms, legs and chest off the floor. Hold for two breaths. Slowly lower back down whilst inhaling, and repeat. Looking for more variety? You can also unlock your core power with yoga. Or try out a gym pass to discover new fitness classes that help train your core. The side plank is a good one, makes you breathe really deeply! I would say add some weights to the above exercises, especially the side planks and bird-dog and you have some balanced, decent core exercises. I don't do exercises specifically for my core, but my whole workout but I do a similar exercise to the 'bird-dog' but with weights, and I also do the superman when I'm in the mood.